Along the tuberose star, there are frangipani, neroli and ylang ylang as a supporting actresses. The first two bring out the stem-green aspects of tuberose and gardenia; the latter highlights its creamy, leathery, salicylic qualities. There are some oak-barrel-like undertones from the sandalwood and agarwood, giving the leather a sturdy frame to stretch on. Slowly the smokiness dissipates and makes room for a smooth, woody-vanilla skin-scent. There is also a hint of something fruity-floral (perhaps the davana), and the floral gardenia illusion, although subtle, is felt in a suave, smooth, tropical-floral-on-warm-skin way. The interesting things about complex compositions and raw materials: Once you notice something, you will notice it again in different stages of the composition. 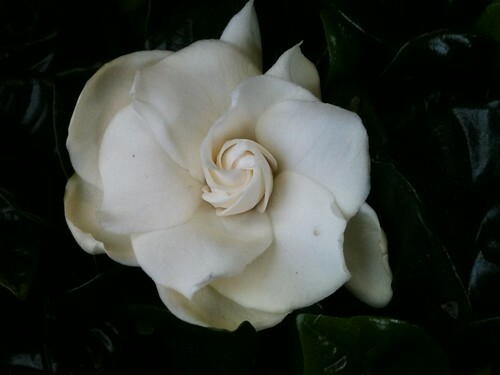 Another time around wearing Black Gardenia, the juicy fruitiness of the Davana comes off right away, adorning the tuberose, shimmering and reflecting the ylang ylang juicy banana aspects, and creating more of a tropical-fruity effect, where as in the first times I worn it, I noticed the creamy-green tuberose facets more.